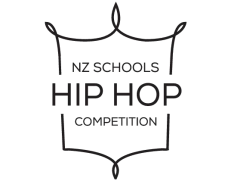 We offer two online competitions (Eastern & Northern) as part of the NZ Schools Hip Hop Competition. In each competition, crews are competing for regional titles and the chance to attend the 2018 National Schools Hip Hop Championships. Entry to the 2018 Northern Hip Hop Competition is and open to crews from Tauranga & Waikato to the top of the North Island. Crews upload a video of their routine to our dropbox folder. Videos should be uploaded to our drop box folder by 5pm August 4th. Name your video file with your crews name when uploading it to the drop box. Ensure that your music track is clearly audible in the track. A static shot – it must not pan or zoom. Unedited – no cuts, edits or digital effects. Lit with plain white lighting – you cannot use effects like strobe or coloured lighting. Less than 200 MB in size. Of your crew only. It should not contain audience members or bystanders.